Recorded Live at Hard Rock Calling Festival, Hyde Park, London, England - June 27, 2009. Files: 25. :: Size: 1.08 GB MB (flac). Personnel: Neil Young - guitar, harmonica, pump organ, piano, vibraphone, vocals :: Ben Keith - pedal steel, lap steel, guitar, organ, background vocals :: Rick Rosas - bass, background vocals :: Chad Cromwell - drums, background vocals :: Pegi Young - background vocals, vibraphone, piano, percussion :: Anthony Crawford - background vocals, piano, electric guitar, acoustic guitar :: Larry Cragg - banjo on Old Man. d2t06/d2t07 - The O2 , Dublin, Ireland, June 21 2009 - d2t08 - Trent FM Arena , Nottingham, England, June 23 2009 - d2t09/d2t10 - Aberdeen Exhibition Centre, Aberdeen, Scotland, June 24 2009. Young has been playing The Beatles’ Sgt. Pepper classic, A Day In The Life, as his encore closer in recent shows. A Day In The Life was primarily John Lennon’s composition, but McCartney contributed the upbeat middle section, ‘Woke up, fell out of bed, dragged a comb across my head… At the beginning of that point in the song, Young turned sideways, looking offstage. As the band played the steady thumping beat, McCartney ran out to the cheers and surprise of the fans, stood alongside Neil and sang the rest of the song. 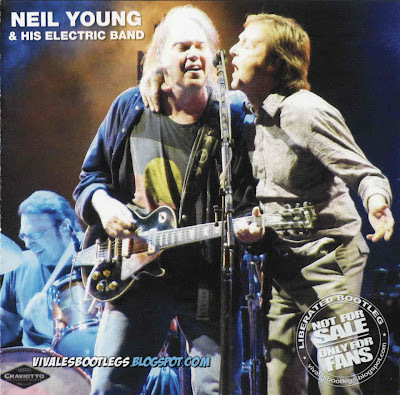 Young played the ‘orchestral climax’ section on his guitar, adding sustained feedback and general chaos, finally ripping his guitar strings and singing the eerie ‘ahhh, ahh ahh ahh,’ vocal chorus. The crowd went suitably nuts. To end the song, after the final chord, Young and McCartney walked over to the xylophone onstage and ponked a few whimsical last notes. 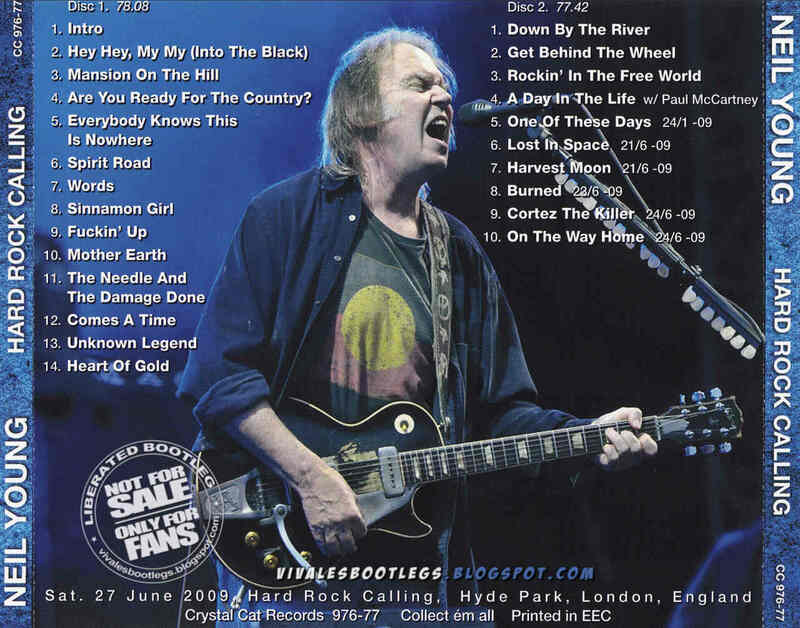 From grunge to rock to mid-tempo ballads, Neil Young drew them out and entertained the crowd with a pleasing set. A minor quibble: with many songs from the Harvest album, one would have wished that Young had added Out On The Weekend as well. Thanks to tbugsett who recorded and shared the tracks on the Dime site. tbugsett noted: “I was very close to one of the (speaker) stacks and Rick’s bass was more felt in the chest than actually heard. The ground felt almost like an earthquake… Hence the recording is very bass-heavy. I thought for a bit of doing some eq before uploading but decided in the end against it as this is a more true replica of how it sounded.<-(Info taken from examiner.com). What an unusual pair Neil and Paul. It makes me wonder what they would come up with if they recorded a cd together. I was there and it looked like that Macca just came on & joined in on A Day in the Life. Don'y know if he was exactly invited!